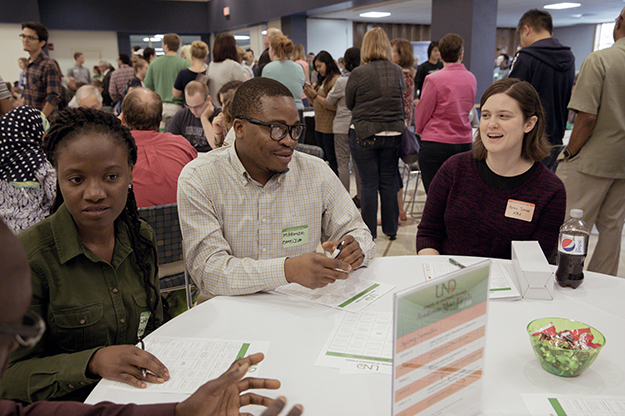 UND graduate students (left to right) Chioma Onwumelu, Makinde Omojiba and Aerin Spade enjoy the Graduate Welcome Event, put on by the UND School of Graduate Studies, on Aug. 21 at the Memorial Union. Photo by Jackie Lorentz. As a partial solar eclipse passed above UND’s Memorial Union on August 21, hundreds of graduate students inside had their eyes trained on other things. Their new academic path. Their new student colleagues. Their new uneclipsed future. First-year MBA student Aerin Spade joined a table with other new and returning students at the Graduate Welcome Event, a social affair with information on graduate workshops, a resource fair, food, games and giveaways. 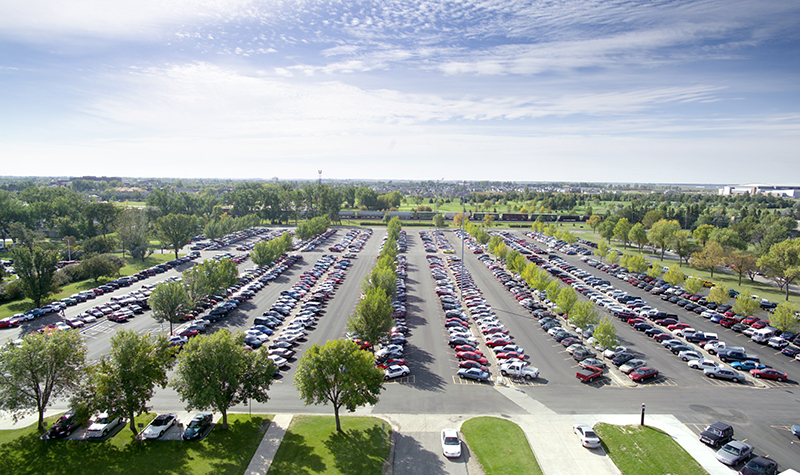 The event is just one of many ways the School of Graduate Studies is helping its students find their place and succeed at UND. Last year, soon after Grant McGimpsey added the role of Graduate School Dean to his Vice President for Research & Economic Development duties, he approached Associate Dean Chris Nelson with an idea: bring together graduate faculty representatives from all Colleges into one advocacy group charged with making the grad school experience better. They’ve come to informally refer to themselves as The Gradvocates. The committee currently comprises faculty advocates from across university. They meet weekly to discuss graduate school-specific concerns brought to them by students or other faculty – anything from housing to health insurance. “The meetings are also devoted to new programs, including professional development for graduate students, as well as what kinds of things should we be doing, how to do them and how to work best with graduate students,” Nelson said. Last year, Grant McGimpsey, who serves as dean of the School of Graduate Studies, approached Associate Dean Chris Nelson with an idea: bring together graduate faculty reps from all of UND’s Colleges to make the graduate student experience better. 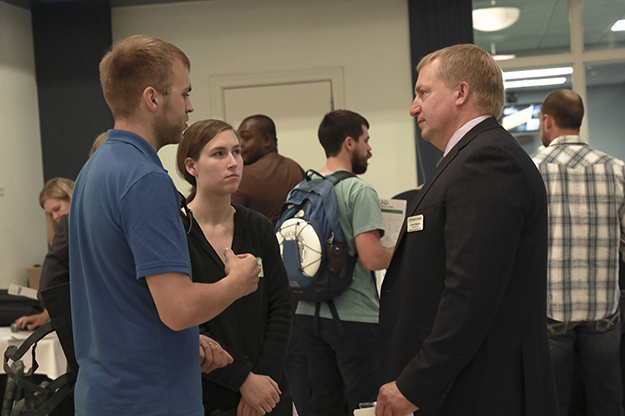 Today, that group refers to itself as “The Gradvocates.” (Above) Nelson talks with graduate students in mathematics, Hans Musgrave and Paige Relling, during the School of Graduate Studies’ recent welcome event. Photo by Jackie Lorentz. The events and workshops that rise out of the Gradvocates meetings are designed to meet several goals, including promoting graduate education, increasing grad student satisfaction, and a growing request – professional development opportunities. “This is a concern at more and more grad schools across the country, so as you would expect, it’s a concern of our graduate students as well,” Nelson said. 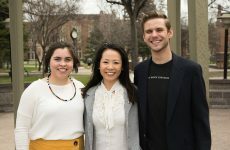 The graduate advocacy group has helped create development events like Graduate Research Achievement Day (GRAD) in March and the Three Minute Thesis competition in April, with another planned for January. It’s additionally planning at least five workshops in the coming year focusing on pedagogy, grant writing, effective professional communication, interdisciplinary collaboration, and research philosophy, methods, and ethics. 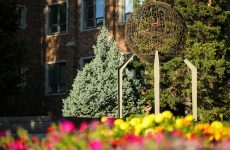 The Gradvocates are also intent on improving the student experience with social opportunities like last week’s Graduate Welcome Event and the coming “Weekend in Winnipeg” – a bus tour planned in conjunction with the UND International Center. An enhanced student experience includes a support system, and when new graduate friends can’t help, faculty representatives can step in as point people. Nelson noted that moving from undergraduate to graduate education is often an anxiety-laden process. While The Gradvocates are tackling goals at the student and College level, McGimpsey believes their work is laying a foundation for even larger objectives. Nelson added that the graduate faculty advocates often discuss how they can support action items of the Strategic Plan, such as further developing graduate education, finding program growth opportunities and driving toward Carnegie R1 research status. For students like Aerin, that enthusiasm and leadership may be just what’s needed to help her settle in to her next scholarly stage.